Rootstocks are used in many tree fruit systems to provide growth advantages and/or pest and disease resistance without affecting (sometimes improving) productivity and fruit quality. 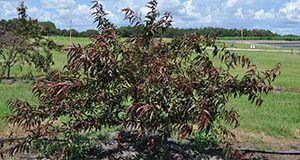 This 6-page document discusses the use of rootstocks for Florida stone fruit. Written by Ali Sarkhosh, Mercy Olmstead, Jose Chaparro, and Thomas Beckman and published by the UF/IFAS Horticultural Sciences Department, November 2018.